Holidaymakers have been advised to be vigilant following a significant increase in jellyfish in various parts of the world. After the recent spell of warm weather an increase in jellyfish blooms has been noted in UK waters as well as across large sections of the Mediterranean, which is a holiday hotspot during the summer season. The news may be of interest to all Brits heading off on holiday this summer, in particular those with diagnosed conditions who are travelling with pre-existing medical travel insurance, as certain types of jellyfish are known for their potent sting. Even those holidaying within the UK might want to practise caution, as the Marine Conservation Society (MCS) said lion's mane jellyfish have been sighted in greater numbers around North Wales and north-west England. The charity warned the sting of the lion's mane jellyfish can be powerful and advised anyone taking part in an ongoing survey to measure numbers to only look but not touch the sea creatures. People are being asked by the MCS to report their sightings of jellyfish wherever they see them in the UK as part of its annual survey. The sea creatures surged on to the news agenda in June when a mass arrival of millions of jellyfish was reported along thousands of miles of the Mediterranean coastline. 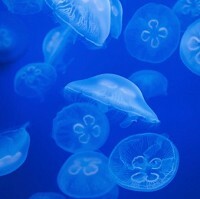 Dr Peter Richardson, biodiversity programme manager at the MCS, said fluctuations in numbers can reveal much about the health of the seas, although he conceded that still relatively little is known about jellyfish. There is a debate among scientists as to whether the increase in numbers reported recently is simply part of a natural cycle or if it is the result of other factors linked to humans such as over-fishing, pollution or even climate change. Increasing numbers of moon, compass, blue and lion's mane jellyfish have been reported in UK waters since the spell of hot weather arrived. "The scarcity of jellyfish reports before June was unusual and could well be linked to the exceptionally cold spring," Dr Richardson commented. "However, as our waters warmed, sightings of jellyfish increased."